Digital diet | Take Home a Souvenir! 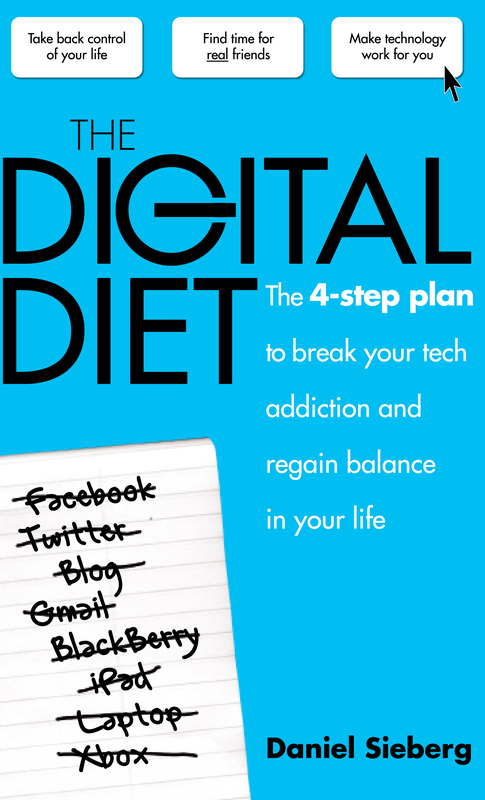 The latest post in our Author Corner comes from Daniel Sieberg, author of The Digital Diet. The book provides a four-step plan to help you re-think your tech usage and to regain balance in your life. Daniel Sieberg’s guest blog post tackles that modern problem we all struggle with: how to switch off on holiday. Whether you’re going screen-free altogether, or simply cutting down (because no-one wants to get between a teenage girl and her mobile phone), Daniel Sieberg offers some useful tips for your summer holiday, to help you step away from the screen and into the sun. Planning for any holiday these days often brings up a digital-era dilemma: how to enjoy being out of the office without being totally out of touch? And is it better to completely disconnect or keep one finger plugged into the online world? Just like “The Digital Diet,” there’s really no one-size-fits-all approach to solving this question but there are ways you can at least minimize any high-tech interference while soaking up some rays. First, create a customized away message for your work email with specific guidance on what people should expect from you. In other words, if you tell people you will not be online and won’t be responding to emails then stick to it– anything less than complete adherence creates a slippery slope of expectations from other people and erodes separation from your inbox. Should you prefer to check email on occasion then say you’ll do just that with the understanding that your response times may be delayed. Next, think about which devices you really need to bring. Lugging around every phone and tablet and “phablet” you own will only mean increased diversions. Try to consolidate your content (books, movies, games) so you can minimise the distractions but still have some entertainment for when the weather turns sour or you just want to kick back for a bit. There’s no shame in using your devices for an occasional distraction provided you aren’t going on safari or ignoring someone around you who expects your attention (this is key to enhanced marital relations). It’s also worth considering a strategy for the family unit as a whole. For example, the kids (and parents) can each bring one (or two) devices but no one is allowed to have them out during meals or sightseeing unless it’s to take photos. Think of creative ways to incentivise it, too, like offering an ice-cream or more spending cash if they stick to the rules. Cutting out technology entirely with most kids means there’ll be pushback and depriving them of all connectedness might result in more family conflict than closeness. As such, it’s worth exploring the idea of moderation with the caveat that as a parent you’ll need to be more available to interact with them rather than letting the screens do all the work. Remember, too, that we often falsely amplify any demands on our time and the urgency with which we communicate. If you don’t check email every 15 minutes then your co-workers will still survive. The world will carry on. And they’ll probably just be jealous that you’re likely having an amazing time. We all need to decompress once in a while and I often talk to employees about having renewed perspective by getting some temporary distance. Finally, if you really need help to detach from all the cords then you might want to consider a vacation somewhere that affords no access to the internet or a tech-free retreat. The charity Anxiety UK released a study that found 60 per cent of us need to fully disconnect to begin to really relax and get a true break. Just be prepared to dig through more emails upon your return since of course we know that hitting the pause button won’t make it all go away. But you can go back feeling more invigorated than ever to surf the digital waves away from the beach. Don’t forget to check out the rest of our Author Corner blog posts! Yesterday saw the first post go up on the Digital Diet blog, entitled “Planning my Digital Diet“. I am looking for other UK bloggers to join me on a digital diet next month – an opportunity to rework your relationship with technology to make it work for you, rather than the other way around. I am going on a digital diet because I want to reclaim my brain. I want to be able to focus on one task for more than five minutes at a time without the internet intruding. If you can relate to this, take a look at the site, and maybe consider signing up. Try something new this year! New year, new you: it’s time for a digital detox. Technology is increasingly taking over our lives. Our digital lifestyles are more of a weight on our shoulders than we know: many of us can no longer focus on a single task or face-to-face conversation without wanting to check our emails, Facebook or Twitter every few minutes. The Digital Diet will help you to take control back of your life, find time for real friends and most importantly, make technology work for you, not the other way around. Just today in the papers we’ve seen news that Bolton Wanderers footballer Marvin Sordell is being offered help by the club for his technology addiction, with Facebook and Twitter in particular being mentioned. So join me, Emily, as I embark upon the four-step, twenty-eight day plan to redress the balance in my life and break my tech addiction. I will be blogging about it over at The Digital Diet blog, and am inviting you to join in. Happy Christmas to all our readers from the whole team here at Souvenir Press! If your Christmas goes anything like mine, by now you will have given and received all your presents, and you’ll be in that awkward space between meals, waiting for dinner to be ready. Or waiting for the Queen’s speech. Or waiting for something good to appear on TV. Well, fear not. Some of you lucky readers will have been given book tokens. Some of you even luckier readers might have received e-readers, so now’s the perfect chance for you to work out what to buy, or what exciting books to load onto your brand new e-reader. And we’ve got some fantastic suggestions for you. Without a doubt, one of the most inspiring titles you will read this year. Jess has Tourettes Syndrome, which means that she makes sounds and movements over which she has no control. Follow a year in her life and the whole spectrum of her experiences, from the heartwarming to the heartbreaking. Witness the kindness and the cruelty of strangers. And above all, meet Jess: courageous, optimistic and inspiring. Do you use toilet paper? Well, of course you do. Everybody does. It is one of the most important (but least talked about) inventions of the 1800s. Well, not inventions. It was invented long before then. But that’s when it broke through into mainstream society. But how much do you actually know about loo roll? Not much? Time to learn! A fascinating history of a product that we all take for granted, and can’t live without. Everyone’s talking about it. John Lloyd on Desert Island Discs called it “the best book I’ve ever read on the nature of what actually is, what the world is about, and how you should behave.” It’s been reprinted twice in the last month. Alan Watts presents a critique of Western culture and a healing alternative. Offering spiritual answers to the problems of a materialistic lifestyle, this book may just change your life. Maybe you’re looking ahead to 2013, trying to plan your new year’s resolutions. How about this one: take a step back from the technology that is increasingly running our lives, and instead reconnect with friends and family in the real world. The Digital Diet will help you to take control back of your life, find time for real friends and most importantly, make technology work for you… not the other way around. Or maybe you’re just looking for some entertainment. A Taste for Death was serialised on BBC Radio 4 in the week before Christmas, in an adaptation starring Daphne Alexander as Modesty Blaise, and written by Stef Penney. If you heard the adaptation, now is the perfect opportunity to pick up a copy of the book and see what they had to cut out. Hint: the book has a sword fight in it! And you can find out about the whole series. Whatever you do over the festive period, we hope it is happy and peaceful, and we will see you in the new year. Happy Christmas, everyone, and best wishes from all of us at Souvenir Press.